Some believe that the tower was given its name because of the sun´s reflection off the gold tiles that once covered the dome. Others argue that the reason for the name is the fact that all the gold coming from the new world was guarded in this tower and that an other tower existed on the other side of the river, being the Silver tower. In between the two towers there would have been a heavy chain preventing any ship to pass unnoticed. 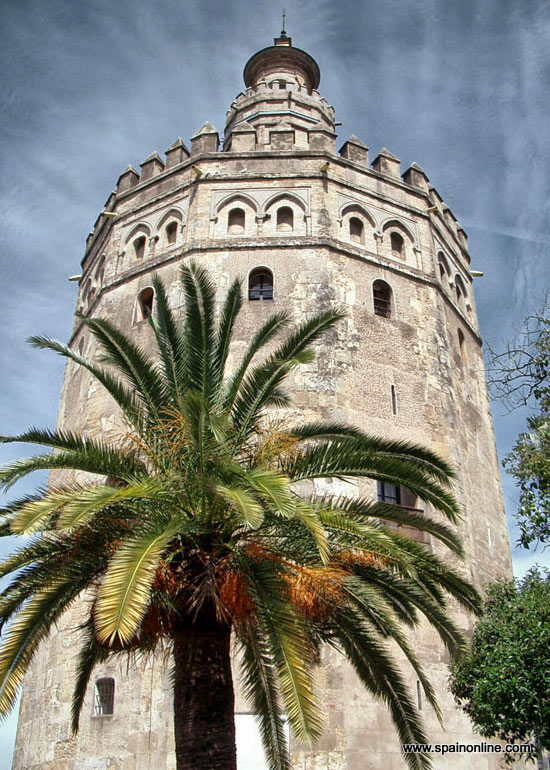 There is also a story that associates the Gold Tower with the hair colour of a beautiful damsel who King Don Pedro locked up in the tower while her husband was away at war. This tower of twelve sides, was built at the beginning of the 13th Century. Large chains used to be connected from the masonry base of the tower to other side of the river and acted as a protective entranceway to the port. The highest part of the tower was added by Sebastian Vander Borcht in 1760. Today it is a naval museum which engravings, letters, models, antique navigation instruments and historical documents. In this museum we also find information on the prestigious naval history of Seville, the importance of the Guadalquivir River and the paths of numerous famous navigators.